PUNCH IS ONE OF THE VERY OLDEST HABANO BRANDS. Don Manuel Lopez of Juan Valle & Co founded it in the mid 19th Century with an eye to the booming British market where a humorous magazine of the same name was much in vogue. A contented Mr Punch, the clown who personified the magazine, is still featured in every box, cigar in hand, and surrounded by 19th Century images of cigar making that remain virtually unchanged over a century and a half later. In 1925 the Punch moved to the factory where Hoyo de Monterrey was made and this long association continues to the present day. 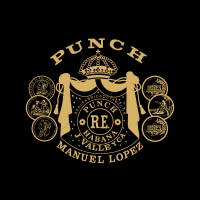 Punch’s distinct medium flavour created with a blend of tobaccos from the Vuelta Abajo region is available in a wide variety of sizes “totalmente a mano, tripa larga” – totally hand made, long filler.